Winter, to me, is watching rain quietly trickle down the windows of my living room. It's driving home from work, chasing the pale sun that's rapidly setting in the west. It's getting an opportunity to wear my pink tartan wool trilby, which I LOVE, but which spends most of the year stuffed down the back of my closet. It's dark fuzzy moss growing on the stones in the corners of my garden. And it's mushrooms. A brown paper sack full of these spongy, intricate, woodland gems, smelling of leaf litter and cold black earth, is like a little bag of treasure in my grocery basket. The richness and earthiness they contribute to a meal makes them perfect for eating in the colder months. Having said that however, in my house, it will have to be a meal for one; I'm the only one who eats them. So, on a busy weeknight when Richard and the kids were having takeaway pizza, I made myself a little single-serving quinoa and wild rice risotto with mushrooms, and it absolutely hit the spot. This risotto has that lovely warmth that spreads under your rib cage in the way only comfort food can. Plus, unlike my favourite comfort food (did someone say POTATO BAKE? ), it is very low in fat, full of protein, high in iron, magnesium and fibre. If you have had quinoa before cooked in milk or stock you might think this risotto sounds a little tasteless due to it only using boiling water. However, all that lovely mushroom and garlic juice becomes a lovely stock in its own right during cooking. Of course, for a non-vegan version you can add bacon for extra flavour. Boil a full kettle of water so you have some near-boiling water ready to go for the rice and quinoa. Heat a little oil in a saucepan and saute the garlic and onion until browned. If you're including the bacon, add this now and cook till it browns and crisps up a little. Add the mushroom, let it brown for a few minutes, then and a little hot water, just a couple of tablespoons, to get all those lovely flavours mingling. Add the oregano, and salt and cracked pepper to taste. Add the quinoa and wild rice and two cups of boiling water. Bring to the boil then cover and reduce to a simmer. Give it a stir every now and then. 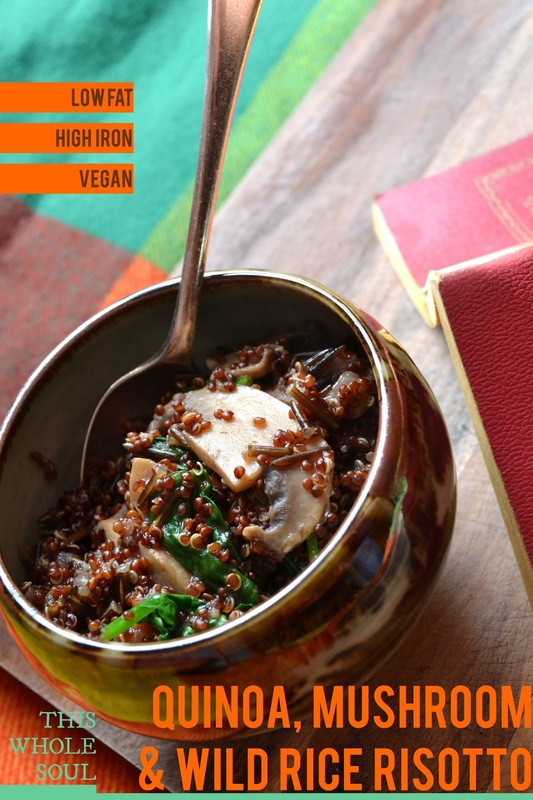 It should take around 15 minutes, slightly less if you are using white quinoa. If all the water is absorbed after 15 minutes but the quinoa and rice is still a bit crunchy, just keep adding small amounts of boiling water till you see the wild rice to start splitting and showing some of its white insides, and the little white spiral germ of the quinoa springing out of the grains. Add the spinach during the last few minutes of cooking so that it wilts down. Serve topped with the nuts and seeds (which of course, I forgot to do before I took the photos). Serves 1 hungry hippo or 2 people who like small portions. Note: some people recommend washing quinoa first as they have found it to be bitter. Can't say I've ever noticed any bitterness, but feel free to give yours a rinse in a fine sieve before cooking.